Cody Martin scored season-high 21 points and dished out seven assists in 93-73 win Saturday. 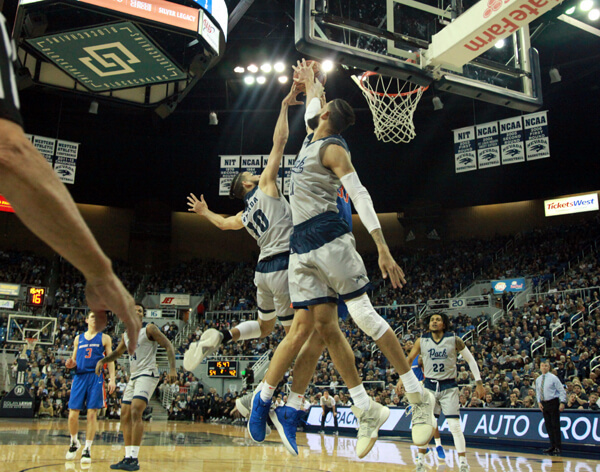 The eighth-ranked Nevada Wolf Pack improved to 21-1. 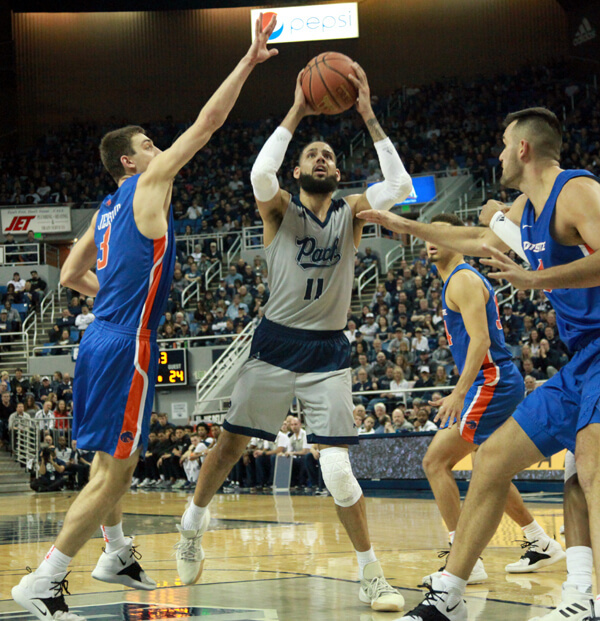 After two meetings with the eighth-ranked Nevada men’s basketball team, the Boise State Broncos are quite familiar with point guard Cody Martin. Once again, Martin’s dominant play on both ends of the floor led the Wolf Pack to a 93-73 victory Saturday afternoon at Lawlor Events Center. On Jan. 15, Martin’s game-winning 3-pointer helped the Wolf Pack escape Taco Bell Arena with a 72-71 win. On Saturday, Martin one-upped his performance with a season-high 21 points, seven assists, four rebounds, four steals and just one turnover. Nevada improved to 21-1 overall and 8-1 in the Mountain West Conference. Twin brother Caleb Martin led the offensive barrage with a game-high 30 points on nine of 16 shooting playing the entire 40 minutes. After Martin’s short shooting slump, coach Eric Musselman adjusted to giving reigning conference MVP 30 touches in the paint per game. As a result, Martin is crashing the paint and moving off the ball to balance his effective 3-point shot. Nevada shot a blistering 55 percent from the field and 46 percent beyond the arc. Five players scored in double figures and the Wolf Pack recorded 22 assists to four turnovers. The constant ball movement around the perimeter killed the Broncos’ 2-3 zone during the early stages of the second half. Steering away from the highlight-reel dunks, Porter showcased his improved perimeter shot with a smooth post fadeaway and his first three-pointer of the season. Porter finished with seven points and just one rebound. Jordan Caroline recorded his 12th double-double of the season and 40th of his career with 13 points and 13 rebounds. He moved to sixth place in Nevada’s all-time rebound list. Senior Tre’Shawn Thurman’s play of late has earned him a spot in the starting lineup for the third-straight game. Thurman chipped in with 10 points and was a crucial outlet of breaking the Broncos’ zone. 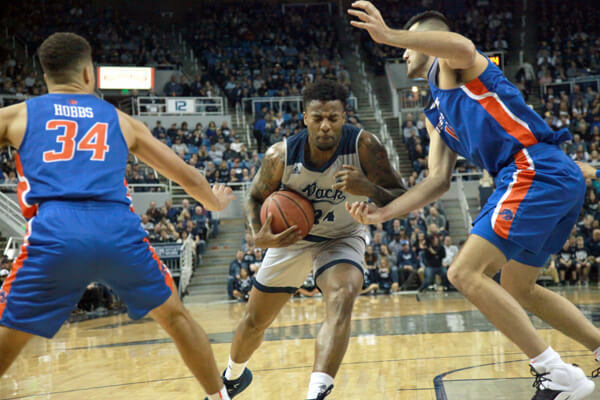 Nevada held Boise State to 46 percent shooting and 43 percent from behind the arc. Justinian Jessup and Derrick Alston each tallied 19 points. 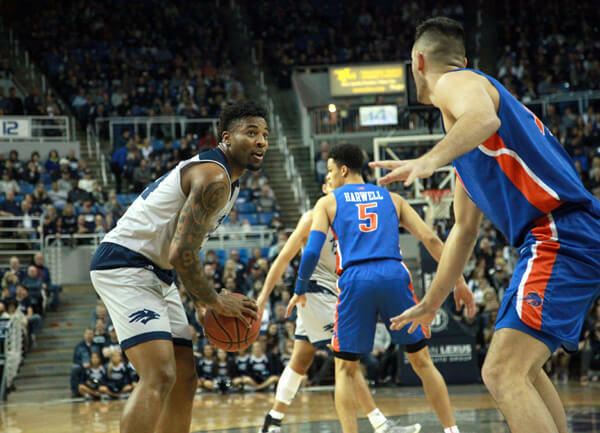 The Wolf Pack forced 11 turnovers and out-rebounded Boise State 33-30, but recorded just four offensive rebounds, none of which came in the first half. Musselman saw a big adjustment from the last game. Thurman, Porter, Caroline and the Martin twins made up the regular starting unit, all five players are redshirt seniors. 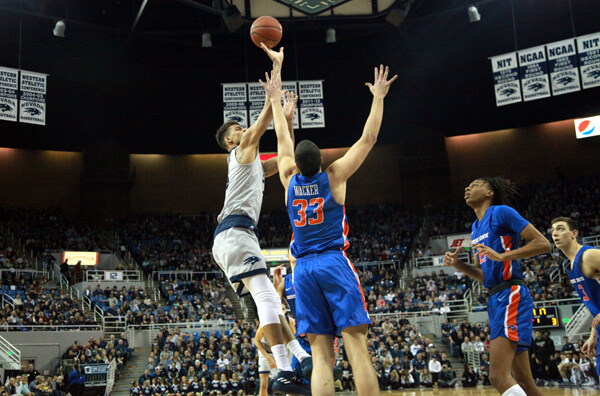 The Broncos attacked Nevada’s biggest weakness by opening the game with a 2-3 zone and throwing multiple bodies on Caleb Martin. Nevada answered with a steady dose of Caroline inside and jumped out to an early 12-3 lead. Boise State battled back with several second-chance opportunities. The Broncos were in the double bonus with four minutes remaining in the first half and capitalized with a 9-3 run. Nevada closed the half out on a high note and led 40-31. Jessup hit his first three shots to open the second half. Three-straight foul calls on Nevada in one possession brought the 11,207 fans up in arms and a disgruntled Musselman storming to half court. Nevada pushed its lead up to 16 with under 10 minutes left to play. Musselman’s frustrations carried over, as he received his first technical foul of the season. The Pack coasted to a 13-7 run and never looked back. The Wolf Pack faces the Colorado State Rams in a road game Wednesday, Feb. 6 at the Moby Arena. The Rams are 9-13 overall and 4-5 in conference play this season. 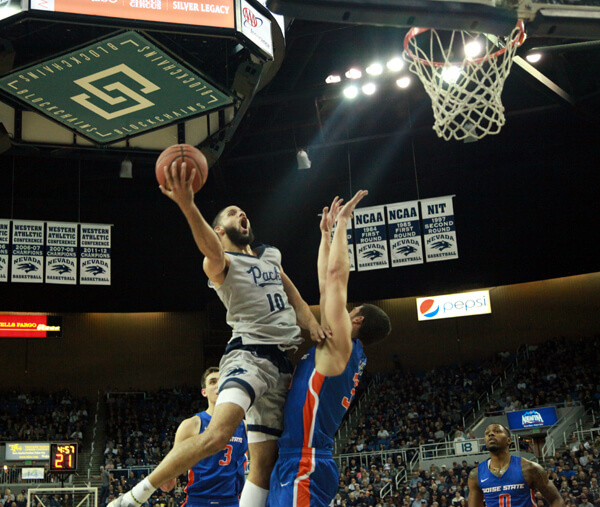 Notes: Caleb Martin passed Cameron Oliver for 24th on Nevada’s career scoring list. … Cody Martin surpassed 1,000 career points. … Nevada has appeared in the last 18 AP and USA Today Coaches Polls. … Jordan Caroline has scored in double-figures in every game this season. … The Wolf Pack has out-rebounded its opponent in 13 games this year. … Nevada has won its last 14 home games dating back to last season. … The Wolf Pack have not trailed in two of its last four games. Caleb Martin gets a finger-roll to go off the glass. Martin tallied a game-high 30 points. Jordan Caroline works his way inside the paint. Caroline recorded his 40th career double-double. Twin Killing: Caleb (left) and Cody Martin (right) both got a piece of Alex Hobbs’ layup attempt. Trey Porter showcases a post-fadeaway. Porter tallied seven points and one rebound.